So… it’s been a long time since we’ve been to a couples spa treatment. My neck and back has been aching since no.2 came along. I gave the Entertainer App a try, then went onto Cobone… and found this. 60 minutes spa treatment, plus pool and beach access for AED 229. That’s AED 460 for the both of us. 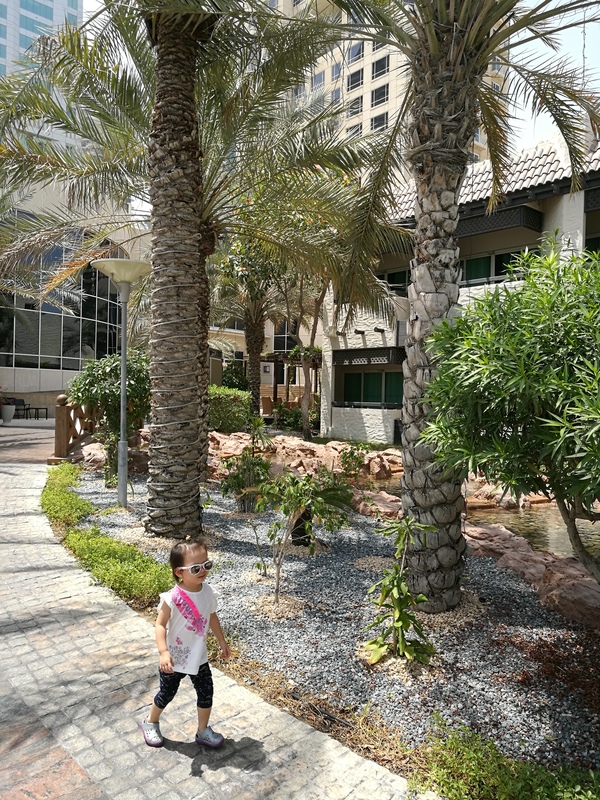 I rang and asked if we could bring the little ones and as she was only 2, they said OK. AED 460 for a daycation at the Habtoor Grand for the family with massages for mummy and daddy! Not too bad. They didn’t have a couples room though, so we ended up getting our treatment done at different time slots. Yes, the deal was very worth it. We managed to get ourselves sunbeds though to be honest we hardly spent much time on it as we were in the water for most of the time. PS – It was 40 degree celsius yesterday. Ten minutes on the sunbeds and you look like you’ve just walked out of a session of bikram yoga. There is a Kid’s Club with a playground outdoors, and a small indoor area – however you will have to pay to use it as it is not included in the deal, so no comments there. The main pool was fairly crowded when we went but still nice enough to bob around and attempt to do some laps, whilst trying not to crash into people. There is a shaded bar area which is nice, with the usual overpriced drinks – 25AED for soft drinks, around 50AED for a beer. Nice-looking girls with make up and bikinis sitting by the bars as well (note to self : Time to do more yoga). No happy hours (or any deals that I know of?) – let me know if you do. Suggest to save yourself a few dirhams and bring your own bottled water in. Peacock and chicks outside Luciano’s! We had lunch at Luciano’s – which we’ve been so many times over the years. They open at 12:30pm so perfect time to get some food into the kids before naptime as well. Despite my complaints to introduce local water (at every single visit, over the last 6 years) – they still don’t…… so we’ve just accepted the fact and decided to be that family that brings in their own bottled water 🙂 Try their Pacheri alla Carbonara with delicious pork bacon, and Pizza Siciliana (also with pork ham, hehe). Oh, it’s a 241 with the Entertainer App too, and the staff has always been great. 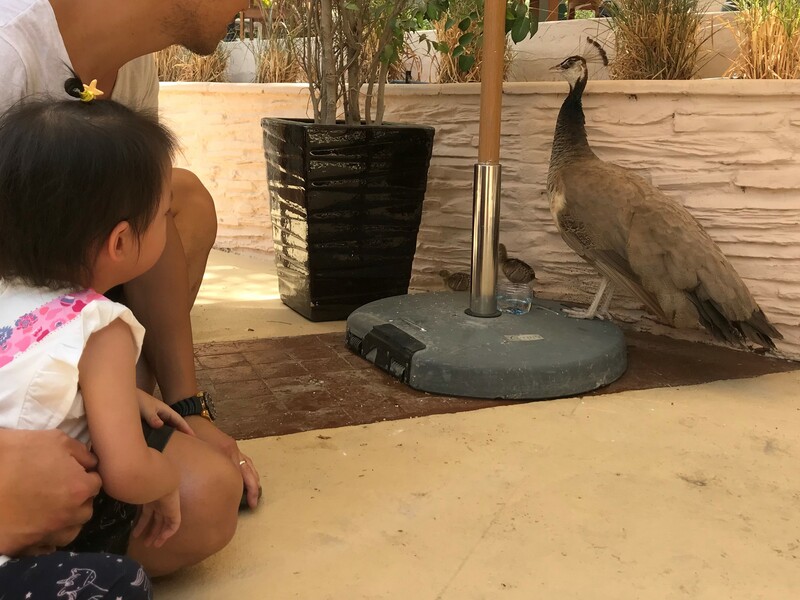 The kids will love the peacocks and birds hanging around. On Elixir Spa itself, it’s hard to review this one to be honest because – this is quite an old spa. Dated, that’s the word you use these days isn’t it. My therapist was pleasant, she put pressure on areas that I requested – and though I did leave feeling refreshed, it really wasn’t one of the best. Three months post-partum, my entire back is just super sore – so please excuse me if I’m really critical when it comes to reviewing a massage session 🙂 There’s lot of improvements to be made on the spa, read on. So, what could be better? Pool area needs more shade. Considering this resort is not one of the newer ones I thought guests would have left enough reviews for them to consider more shade. The only area with shade in the main pool is within the bar area, and underneath this little bridge. Even the kid’s slide pool area doesn’t have much shade other than where this ‘waterfall’ is. Why is the pool water so salty? My 2-year old was going ‘Yucky yucky’ to me whilst we were in it. I know we’re in a resort and the sea is close by it’s not connected! At least it was stopping her from swallowing the water, which she used to do at the pool in our tower. Gross, I know. Unlike other 5-star resorts, you don’t get served complimentary ice blocks whilst you lounge (talk about being spoilt in Dubai!). Or at least not in the very short time that I was laying on my sunbed. Suggest to attempt to serve something, to make a difference. Fix up the shower experience thing in Elixir Spa. I love those things. So disappointed to be told it was broken. Or at least put up a sign to inform guests that it is out of order. The next comment will involve a lot of money on Habtoor’s front, but I’ll just let you know anyways. I think the whole spa layout needs to be replanned. I’m not sure if they ran out of treatment rooms yesterday, but it was really odd how I had to walk out of the ladies changing room, through the public hallway (note : Gym was on my right), into a MALE hairdresser shop, and then into a treatment room right at the end. Honestly, when you’re half naked in a robe, with no make up on, the last thing you want is to bump into someone from work who was getting a haircut there. Day out, woo hoo !